Back cover blurb: NOW YOU SEE HER She’s playing at the school fete with your children. You pull out your phone, scroll through Facebook, and look up again. 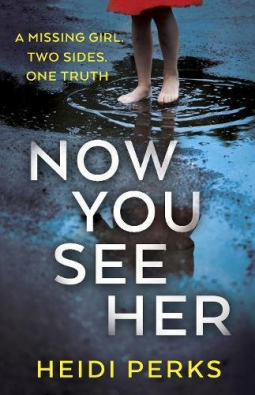 NOW YOU DON'T Charlotte is looking after her best friend’s daughter the day she disappears. She thought the little girl was playing with her own children. She swears she only took her eyes off them for a second. Now, Charlotte must do the unthinkable, tell her best friend Harriet that her only child is missing. The child she was meant to be watching. Devastated, Harriet can no longer bear to see Charlotte. No one could expect her to trust her friend again. Only now she needs to. Because two weeks later Harriet and Charlotte are both being questioned separately by the police. And secrets are about to surface. Someone is hiding the truth about what really happened to Alice. When Charlotte is left in charge of her best friend Harriet's daughter Alice she sees it as a real privilege. Harriet rarely lets Alice out of her sight. On the day in question she has little choice, as her presence at a book keeping course is required. Charlotte, mother to three of her own children, is looking forward to having Alice for the day. She is a quiet and obedient child and is looking forward to the school fete where they are all headed. The fete is packed as these things usually are, and Charlotte is relieved for five minutes peace when the children all head for the jungle gym. Her quiet time is short lived when the children return, without Alice. Charlotte is devastated at the realisation her best friends daughter is missing, whilst in her care. How on earth is she going to break the news to Harriet? She must find Alice, and quickly. The police are quick to arrive, and quick to point the finger at Charlotte. Was she distracted somehow? How did she lose another woman's child. Charlotte could not feel any worse than she already does, but somehow the police make it seem even worse, treating Charlotte like a criminal. I can't say too much more without giving anything away, but I will say that there are some surprises in this novel, and it may not take you exactly where you expect it too. For this reason, I really enjoyed it, though the subject matter is at times difficult it is worth persevering with. You can preorder it now via Amazon online.